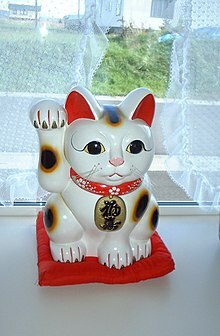 This article is about the Japanese coinage. For the anime, see Ōban Star-Racers. For the print size, see Woodblock printing in Japan. The Ōban (大判) was the largest denomination, valued at 10 Ryōs. Here, a Keichō Ōban, minted from 1601. 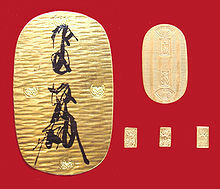 An Ōban was a monetary ovoid gold plate, and the largest denomination of Tokugawa coinage. Tokugawa coinage worked according to a triple monetary standard, using gold, silver and bronze coins, each with their own denominations. Keichō gold coinage: Ōban, Koban, Ichibuban, 1601-1695. The first Oban – Tenshō Ōban (天正大判) – were minted by the Gotō family under the orders of Hideyoshi in 1588. The Tenshō Ōban was equivalent to ten Ryōs, or ten Koban (小判) plates, with a weight of 165 g.
Mark Metzler (2006). Lever of empire: the international gold standard and the crisis of liberalism in prewar Japan. Volume 17 of Twentieth Century Japan: The Emergence of a World Power. University of California Press. ISBN 0-520-24420-6.